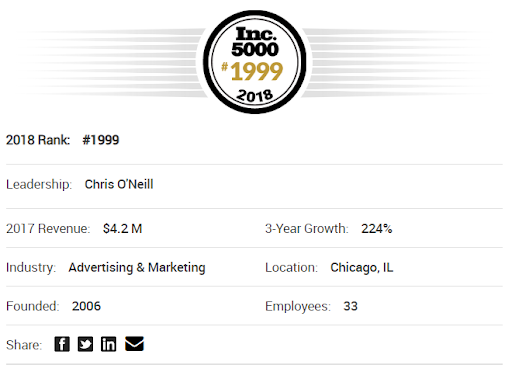 Chicago, October 10th, 2018 – Logical Media Group (LMG) has been named to the annual Inc. 5000 list for a third consecutive year. LMG earned a respective rank of 1,999 out 5,000 on a list that comprises the fastest growing, U.S. based, privately owned companies. Inc. Magazine annually ranks and celebrates companies that report revenue growth. To qualify, companies must be U.S. based, privately held, for-profit, and independent. Inc. ranks qualifying companies according to the percentage revenue growth from 2014 to 2017.
in the second quarter of 2018. This is compared to just 2.2 in the first quarter of 2018. Economists express satisfaction with the 4.2 percent U.S. GDP growth. However, it is even more notable that no company on the 2018 Inc. 5000 list has grown by less than 50 percent over the past three years. Cheers to a third straight year of continual growth! For more information about Logical Media Group, please visit our website at www.logicalmediagroup.com.